Here is one grease that looks good: Lucas X-TRA HEAVY DUTY GREASE. What seems different: not a lithium base - polyurea base. Meaning it lasts longer. "Maintains a constant film of protection even under irregular maintenance schedules" and "lasts two to four times longer" (Lucas also makes lithium greases, among others, so the claim has more credibility than it would if they didn't. And it can also be independently confirmed). It is also a "shear stable" polyurea, meaning it is compatible with lithium greases. Lithium greases thicken more quickly over time. Polyurea, for some people at least, would last longer and not require as frequent replacement. For these people, it would extend maintenance intervals. Would like to hear what others have found, and any references to good information comparing different greases. At first I was going to warn you about electrical problems but I see the American flag on the label so it must be a different Lucas. Well, you've repeated other's marketing claims so in your mind they are now facts. It's going to be very hard to convince yourself of anything different. That's just the way human attitudes work. Really* bike bearings are so lightly loaded virtually any grease will work well. If the grease is just old and otherwise uncontaminated, add a small drop of light oil to each bearing once per year to replace what was lost to evaporation. Last edited by AnkleWork; 10-21-16 at 04:02 PM. I'm finding some difference of opinion on whether it is "shear stable" polyurea (and lithium compatible) or "conventional" polyurea (and lithium incompatible). Best source so far indicates shear stable. Not sure though. Any definitive info would be appreciated. MSDS supposedly indicates shear stable. This is what I use. $10 ($3.33/ounce). Works great. This Extra-Heavy-Duty grease has replaced Mobil 1 Synthetic Grease as my choice of chassis lubricant for our cars, trucks, and SUVs. The 560-degree drop point makes this an excellent choice for the high desert temperatures and off-road punishment -- and the high resistance to wash-out keeps our tie-rods and u-joints lubed when crossing streams or riverbeds. NLGI rated "GC-LB" (highest rating for chassis and wheel bearing grease). Case-IH, John Deere, Deutz, New Holland, and Massey-Ferguson. Exceeds OEM "Lube For Life" requirements. In my experience with several different vehicles operated in severe climate conditons, this grease stays where you put it -- with no squeeze-out, wash-out, or dry-out of the tie-rod ends or ball joints. I won't go back to the Mobil 1 Red Grease -- it got all thin and ran out the end of the grease gun !! The Lucas grease stays in the gun, and it stays in the joints that you apply it to. For those who care for their vehicles themselves, get this stuff -- it's really tough !! You are way overthinking this. As noted, bicycle bearings are very low demand applications for grease so nearly anything will work well. The major problem with bicycle bearings is dirt and water incursion over many miles and no grease can prevent that. Do preventive maintenance at reasonable intervals and the grease you use is almost a non-issue. BTW, 3 oz that Phil Grease tube at $3.33/oz can be had a lot cheaper in a 640 gm (22 oz) tub for about $35 or $1.60/oz. Neither price will put a noticeable dent in your family budget. Called Lucas tech support. They say it's conventional polyurea. But I've lost some faith in tech support personel, even though the guy checked with someone else. So still have some conflicting info on this point. Some reviewers have been using it for bikes, and are quite happy with it. Although it is not specifically a "marine grease," it seems to have excellent water or washout resistance. Been re-packing small bearings on bicycle wheels and cranks with this stuff. Seems like it's working fine. It flows through the needle tip on my grease gun just fine. Holds ball bearings in place. Doesn't leak out of bearing seals. It's all good. It's green. Looks the same - but, more affordable than small tubes of grease sold in bike shops. I've been doing a ton of research on the best lubes for bike cup/cones. Granted, just about any NLGI #2 will work, but I'm really starting to lean towards this product as one of my top choices (based on tech specs). It looks like a great all around grease. They don't give a temp band in the tech info, so I'm looking forward to seeing how my wheels spin in the dead of winter. This is the only grease I'll use in my tractor or other machinery. It is very high quality grease and holds up well even under the extreme demands put on my equipment. It is the best I've seen and I've tried them all. It's great I found it on Amazon, now I can have it delivered and don't even have to leave the farm. And it was a better price than I had found anywhere else. What seems different: not a lithium base - polyurea base. Meaning it lasts longer. I think urea is a specific molecule. Also sold dry in 50lb bags, and used as a (virtually odorless) high-nitrogen fertilizer. Last edited by lightspree; 10-21-16 at 05:17 PM. It's grease, so performance is difficult to determine unless you can isolate it as THE variable that caused part failure. I use Lucas Oil 10301 on the universals and chassis points on all of my vehicles and equipment. The biggest test for me-- a 35 year old Gravely tractor that gets pumped full of 10301 four or five times per cutting season. This is an old, "worn-out" machine with thousands of hours on it. Seals, bearings, bushings, and most other rotating/sliding pieces have had hard lives. Even the slop from wear and tear, the metal-to-metal interfaces perform beautifully- no chatter, whining, or grinding. Before I converted to the 10301 (about 6 years ago), the spindles chattered horribly. They operate much more quietly (assuming with reduced friction) when packed with Lucas. The X-Tra Heavy Duty grease flows nicely out of the gun and it stays put really well- even where seals are direly worn (or holistically nonexistent). Other greases I tried in the past (natural and synthetic) were stringy and tended to sling everywhere. When they got warm, they got thin and migrated all over the place. The 10301 provides a really good blend of slippery and sticky that, at least for moderate RPM parts, even at higher temperatures, stays put. Do you work for Lucas Oil's marketing department? In fact, before I saw your post, I was over on the John Deere site to find out which in their line of (multipurpose) greases is the best or most highly recommended. The comment about frequency of fresh grease is probably a good one. No reason you can't use the poly as frequently as any other. Last edited by lightspree; 10-21-16 at 05:49 PM. I use corn head grease in leaky vintage tractor steering gear boxes. 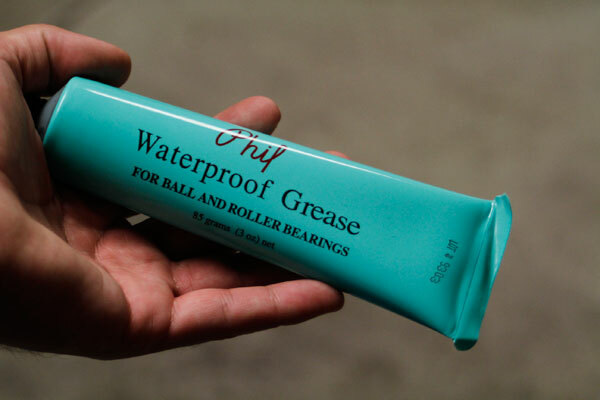 Don't know if I'd use it in my bike wheels, I prefer marine trailer bearing grease. Lucas... The inventor of darkness. Appears they've perhaps now moved to the US and are marketing grease. Last edited by ltxi; 10-21-16 at 06:11 PM. Because it's crystal clear. And it IS. Use whatever grease you want or prefer. Should note that NLGI 2 spec is a defined range, so greases can be thinner or thicker...Lot of fudge room. For example, If I was doing a winter or wet weather servicing, I would go for an NLGI 1 calcium complex or aluminum complex grease...NLGI 2 Di - urea grease would be 3rd on my list...I use Mobil electrical bearing grease, forget the exact name atm, and that grease is spec'd by many bearing manufacturers in "filled for life bearings". I want a grease that won't wash out and lasts. The popular NLGI 2 Mystik JT-6 green label (calcium complex) is used on boat trailers whose wheels often go under water (salt or fresh) to launch or recover a boat and then hit highway speeds. Such a grease is too thick for bicycle use, but you can see under severe conditions that grease is still working. For ~$3.00 a tube you can't go wrong. Finding the NLGI 1 version for bike use locally can be problematic if you don't live in a farming area. The point is use whatever works for you. If you have the money, there are some very expensive greases out there, specialized or space/vacuum conditions, that have performance specs that out perform regular greases. Apparently there are synthetic-base greases with high specs. It used to be that polyurea could not be mixed with another type of grease or bad things would happen, now the polyurea formula has been changed so it is compatible with most other grease types. The biggest advantage of polyurea is that the ratio of oil to thickner is greater in polurea than other greases, so a given volume of polyurea will lubricate longer than other greases. the oil portion is what does the lubircating. Thickner onl;y keeps the oil from running away from the bearing.